Azure International is a leading investment and advisory company focused on China's cleantech energy sector. Founded in 2003, we have a team of 20+ local and international professionals based in China with backgrounds in engineering, marketing, manufacturing, consulting, policy, government relations and finance. In addition to deep advisory capabilities in renewable energy, energy efficiency, carbon management, and energy finance, we have proven capability to invest in and accelerate the development of clean energy companies. Our portfolio and partner companies have achieved both significant commercial success and returns to investors. Azure provides the necessary expertise and execution capabilities in China to lead relationship development with government and strategic partners, project execution, sourcing, sales and technology development – all with deep understanding of Chinese and international requirements. Sebastian Meyer, Azure’s Director of Research, delivered both a keynote and a panel speech at the Winterwind International Wind Energy Conference in Sweden on February 12th this year. Sebastian’s presentations are available for download here. 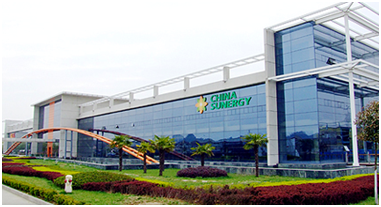 China Sunergy stock is down 65% since March 2015, and has had a series of bad press, such as posting its 2014 Q2 results a year late. We are seeing a rising trend in policy supporting promotion and construction of green building materials. Azure is increasingly active and successful in development and execution of market entry strategies for green building technologies. While planning for 9% consumption on the surface is commendable, all provinces are not created equally and we’ll see some provinces, such as Xinjiang, account for a much larger share of renewable energy generation. A major bottleneck will be transmission and utilization of renewable energy generation resources, and there are no government figures on curtailment forecasts in 2020 and beyond.